The periodic atomic table has many formats of expression. One such FORMAT are atomic, carbon based life forms named humanoids. Thus we have relationship: organic chemistry --> social and economic chemistry. We are interested in the Margaret Mead atomic nuclear family and its carbon atomic financial systems. Thus the origin ---> then carbon 12 based humans and their business activities ---> carbon 12 Federal Reserve Districts. Let's look at carbon atom / molecular continuum signals --> social economics and carbon based humans. Let's look at the Charles Darwin atomic selection process .... selection from the human data pool .... bio-computer data comprised of SYMBOL and NUMBER labels attached to physical biology humans ..... thus giving a data pool of human symbol machines ... human bio-computers ..
known as a molecular PC = Person Computer.. Above, the periodic atomic table INTELLECT via carbon atomic mass 12.01 desires to choose a humanoid for a SUPER-SYMMETRY bio-physics DEMO in Margaret Mead atomic nuclear family output message processing systems. Carbon atomic mass 12.01 ---> perceived as signals 12 and 1. 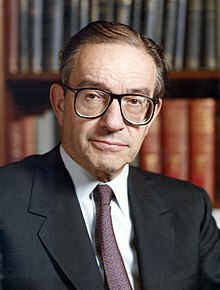 Alan Greenspan (born March 6, 1926) is an American economist who served as Chairman of the Federal Reserve of the United States from 1987 to 2006. He currently works as a private adviser and provides consulting for firms through his company, Greenspan Associates LLC. First appointed Federal Reserve chairman by President Ronald Reagan in August 1987, he was reappointed at successive four-year intervals until retiring on January 31, 2006 after the second-longest tenure in the position. to reach the carbon 12 Federal Reserve Districts. ..... hence, the economic LAWS of Nature that ought be considered in modern REALITY in year 2013. Aug 21, 2010 - its just a measurement. 12= a dozen 12x12=a gross. Organic chemistry ..... possible VIEW of Gross National Product = Carbon atomic mass 12 X 12 Tribes of Alan Greenspan = 144. The other model is the ethane model of 2 carbon atoms ..... atomic mass 12 X atomic mass 12 = 144. Methane has the human reference group of the 4-H Club of teenage farm students in agriculture. Thus we see some pieces to modern economic puzzles about existence and the Nature of things and atomic social economics.